It is possible to customize your email content. The email address from which notifications are sent can also be configured for each project. See Configuring an SMTP mail server to send notifications and Creating a notification scheme for more information. Choose > Projects. The 'Project Summary' page (see Defining a project) for your selected project is shown. You cannot specify a project's email address until an SMTP Mail Server has been previously configured. See Configuring an SMTP mail server to send notifications for more information. 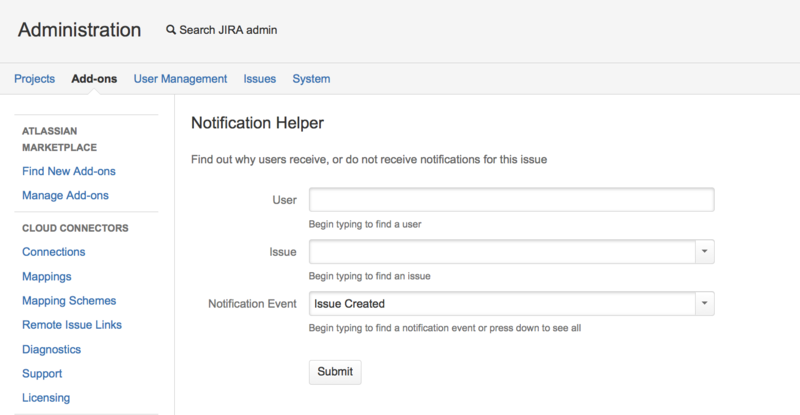 Each JIRA user can specify in their profile preferences, whether to send outgoing emails in either text or HTML format. JIRA Administrators can specify a default email format by choosing the cog icon at top right of the screen, then User Management > User Preferences. Tip: You can also access the Notifications Helper via the cog menu for each issue in the issue navigator, or by selecting the cog icon at top right of the screen, then Add-ons. Select Admin Helper > Notification Helper to open the following page.